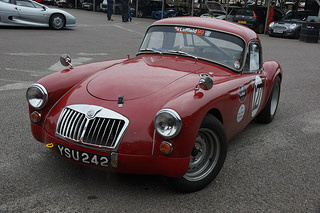 The MGA sports car. In 1951, the MG design team was asked to create an aerodynamic body styling for the MG TD that was to be entered in the Le Mans 24 hour race. This redesign was necessary since, by using a TD chassis, the driver's seating position was too high. However, this turned out to be the showcase for the MGA. Following on from this, an entirely new chassis was designed in which the floor of the car would be attached to the bottom of the frame, rather than to the top as had been done previously. 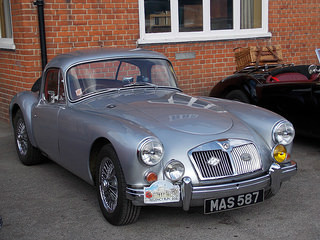 A prototype of the MGA was then shown to the British Motor Corporation chairman for his approval. 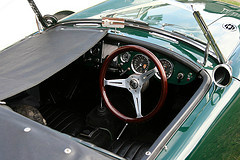 Unfortunately, the timing could not have been worse since he had just enterered into an agreement with Donald Healey to produce the Austin Healey 100 sports car. Although he had originally rejected the MGA prototype, the reality of declining sales of the existing MG T-Series caused him finally to reverse his decision. 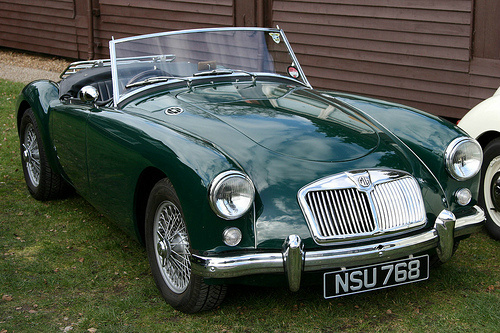 The new MG was to be called the MGA. In fact, the new name was used in an advertising campaign with the slogan "First of a new line". 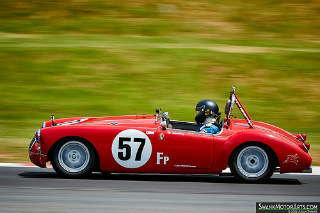 The MGA was originally scheduled to be powered by the 1.2 litre XPAG unit, as used in the TD and TF Midgets. However, it was decided that the new roadster would use the BMC B-Series engine from the MG Magnette ZA saloon. This was a 1.5 litre, in line, 4-cylinder, overhead valve unit, with two SU carburettors. Initially, it developed 68 bhp, but this was soon uprated to 72 bhp. Consequently, the new car was designated the MGA 1500. In 1955, the MGA sports car was well received when presented at the Frankfurt Motor Show. It replaced the previous MG T-Series, and the MG TF in particular, and represented a complete reappraisal of the styling and specification of its predecessors. It was offered as a two door, two seater, as either a convertible or fixed head coupe. One of the advantages of using the B-Series engine was that it would allow the bonnet to follow a lower line. 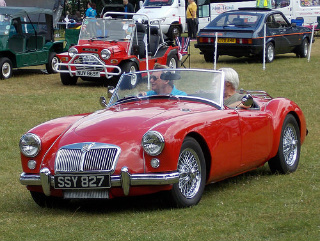 The new design for the MGA was a body-on-frame construction in which a separate body was mounted on a rigid frame. The success of the MGA was reflected in the fact that of over 13,000 cars were built in its first year of production, which was greater than the entire four year production of the MG TC. The majority of this production was exported to the US where it was seen as a ground breaker in respect of styling and performance and being, indeed, a more civilised car than the TF. A year after its launch, the fixed head coupe version appeared, and included such refinements as wind up windows, a wraparound front windscreen, and lockable door handles. However, with this additional weight, it was a little slower than the roadster. When production ended in 1959, nearly 59,000 MGA 1500's were built. A 1955-59 MGA 1500 in good condition would fetch around £18,000/$29,000, whilst an example in excellent condition would command around £30,000/$48,000.